Operation Cancun led approximately 300 police officers to certain locations in the Montreal area and on the Aboriginal communities of Kahnawake, Akwesasne and Kanesetake, resulting in the execution of approximately fifteen searches. Throughout this investigation, the participating Aboriginal law enforcement authorities, including the Kahnawake Mohawk Peacekeepers, Akwesasne Mohawk Police Service and St. Regis Mohawk Tribal Police, acted as first-rate allies in the fight against organized crime. The A-CFSEU partners, namely the Royal Canadian Mounted Police, Sûreté du Québec and Drug Enforcement Administration, also received the assistance of the Ontario Provincial Police. This major roundup operation resulted in the arrest of nearly thirty suspects, including 8 in Kahnawake,10 in Akwesasne – including arrests in Quebec, Ontario and the United States, and one in Kanesetake. Other subjects were arrested in the Greater Montréal area. The members of this ring will face charges of criminal organization offence, drug exportation, possession of prohibited weapons, drug possession, drug trafficking, conspiracy to traffic in a drug, conspiracy to export a drug and drug production. The searches led police officers to seize several firearms, including two AK-47 machine guns, two M-16 machine guns and three grenade launchers. 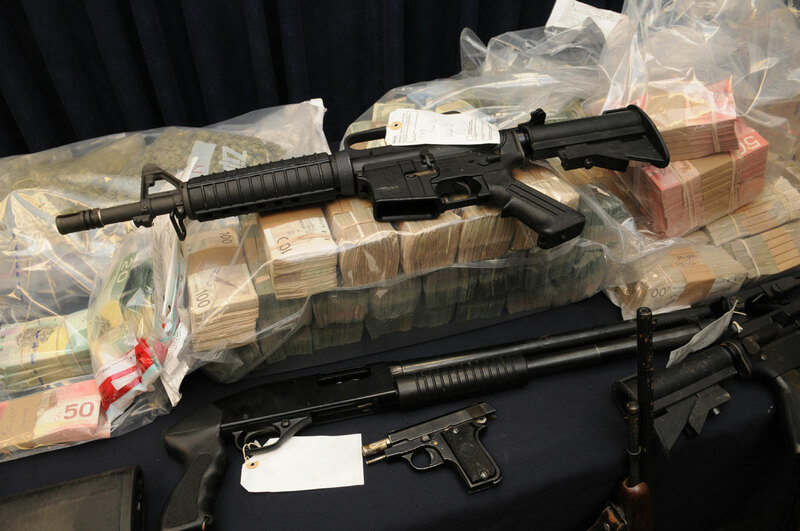 The police also seized approximately 2 million dollars in cash and many other items, including luxury vehicles. Furthermore, the Integrated Proceeds of Crime Unit has initiated an investigation to identify any proceeds gained through illegal activities linked to this criminal organization. Earlier during the investigation, the police had uncovered marihuana grow operations in Châteauguay and Mascouche. Is it gloating to say “we told you so” or is this more of a vindication? It nears mentioning this is just one small haul from littrally hundreds that go undetected. IT IS” HIGH ” TIME THAT SOMEONE HAS DONE SOMETHING ABOUT THESE BASTARDS .. I WONDER IF PREMIER McGIMPY HAS THE BALLS TO DO SOMETHING NOW……. DON’T COUNT ON IT !!!!!!! !